Greek astronomer who wrote the famous book of mathematical astronomy, known as the Almagest, which described the Ptolemaic (geocentric) universe. Translation of epigraph opening the Almagest. 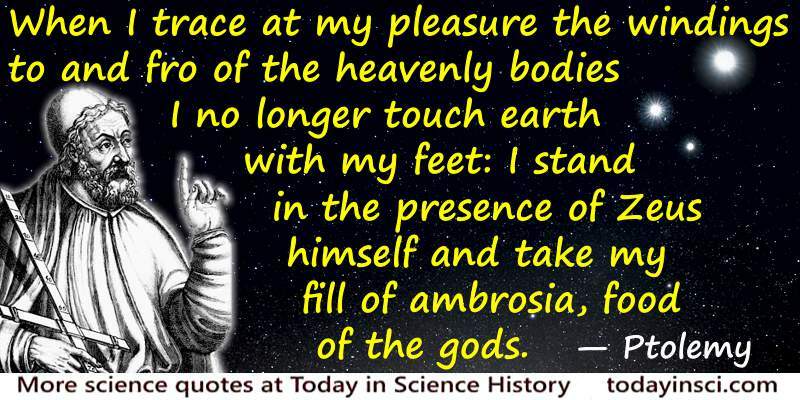 I know that I am mortal by nature, and ephemeral; but when I trace at my pleasure the windings to and fro of the heavenly bodies I no longer touch earth with my feet: I stand in the presence of Zeus himself and take my fill of ambrosia, food of the gods. 1 'The Perimeter of Ignorance', Natural History (1 Nov 2005) (source) . Ptolemy’s Almagest, by Ptolemy translated by G.J. Toomer. - book suggestion.